Over the last six years Montréal’s International Digital Art Biennial (BIAN) has quickly ascended to operate at a scale beyond any other North American digital art event. Launched in 2012 as an outgrowth of the ELEKTRA festival, which focuses on audiovisual performance, the flagship exhibition of the 4th edition of BIAN winds down at Arsenal Contemporary Art this week. Guest curated by the ZKM’s Peter Weibel it explores the theme ‘sing the body electric’ and considers “ideas of the mind, the electrified body, and the way these elements interact,” by bringing together the work of more than two dozen artists working across robotics, interactive installation, and virtual reality. 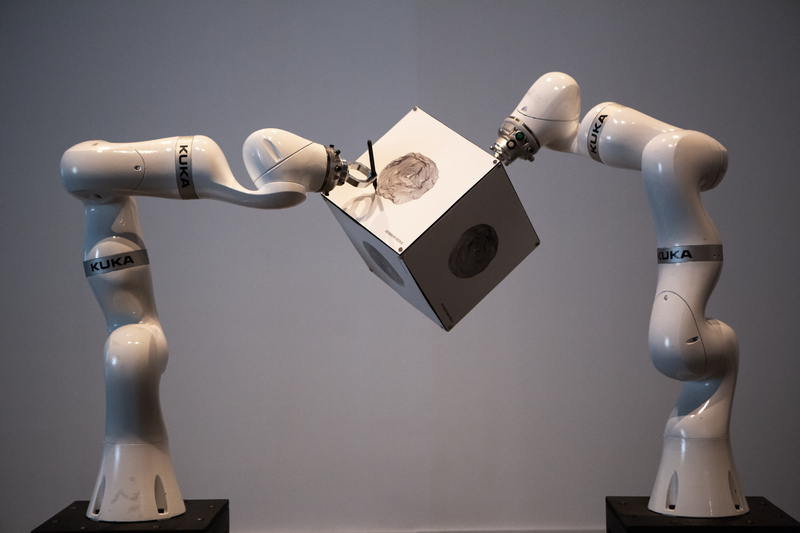 Previous editions of the BIAN have marvelled over the nonhuman, and works exploring robotics and automata appear with reliable frequency. This year industrial robotic arms were out in force, transcribing air quality levels and handling childcare. The first of those tasks occurs in Over the Air, which emerges from South Korean collaborators teamVOID and Youngkak Cho, and programs a pair of massive arms to stencil out visualizations of air quality conditions on a cube—not-so-lightly underscoring the link between industry and pollution Conversely, a vision of machines that nurture rather than dispassionately inscribe is offered in American artist Addie Wagenecht’s Optimization of Parenting, Part 2, which polemically juxtaposes a delicate cradle with a hulking robotic arm—and tasks the arm with rocking it periodically, lessening the burden on a hypothetical overextended young mother. Elsewhere, arms gesture symbolically; Russian artist Aleksandra Domanović’s Substances of Human Origin presents an array of three exquisite pairs of humanoid(ish) arms, which extend out of the wall, signalling labour and suggesting efficiency in a blue, gold, and silver retrofuturist sheen. Acutely digital modes of representation were plentiful across BIAN. 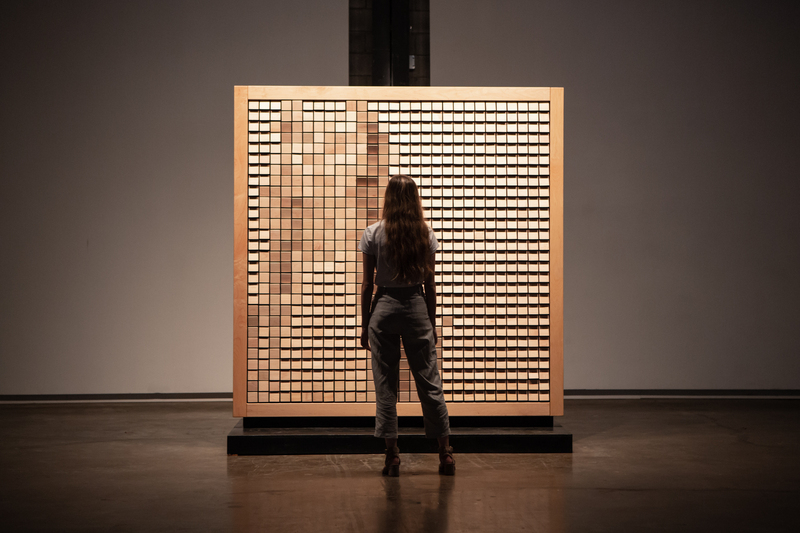 American artist Daniel Rozin presents Wooden Mirror, one of his signature human-scale displays that curious viewers step in front of to see a crude depiction of their likeness rendered in unexpected and unconventional materials. Beyond the pleasure of encountering wood ‘pixels’, it’s a delight to see people pose and gesture for an interface that Rozin has spent a decade-plus refining. A similar experience could be found in Austrian–French artist duo Christa Sommerer and Laurent Mignonneau’s Potrait on the Fly. The cheekily titled computer vision-enabled display renders viewers in flies, which swarm onscreen to construct an image. Not nearly as disgusting (or Kafkaesque) as it sounds, the piece is well executed and smartly staged–with immaculate portraits hung alongside the interactive display. Canada’s Adam Basanta offers emergence and abstraction that starkly contrasts the aforementioned figurative rendering systems. All Weʼd Ever Need is One Another builds a world of colour through the deployment of two desktop scanners standing on their sides, pointed at each other, sending their scans to custom software. Locked in a feedback loop they register each other’s presence as well as local light conditions, and the system is presented as a full-on art factory—printers churning out vivid images derived from the scans, workstations displaying the software in control, notepads revealing process and marginalia—creating a vital space that invites exploration and feels alive, and standing out from the opaque slickness of the majority of the work in the show. 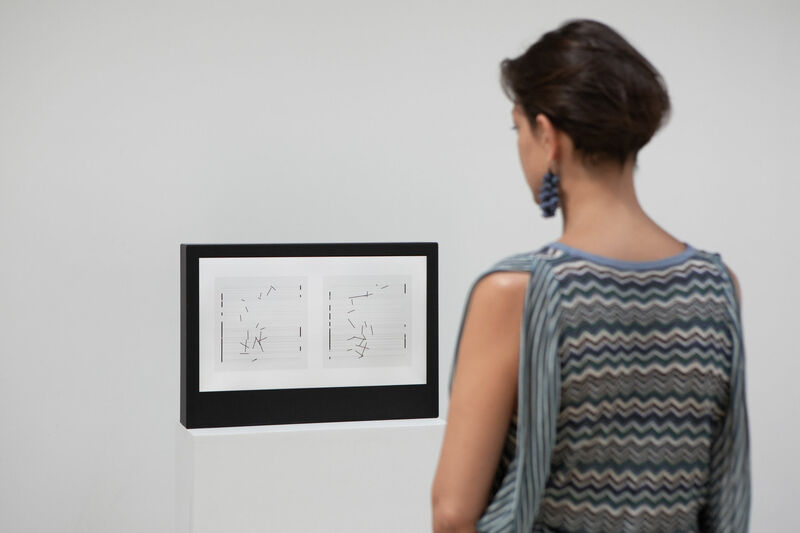 Beyond robotic machinations and algorithmic representation BIAN featured installations ranging from pure spectacle to the sublime. Light Society’s Whispers is definitely the former, creating a dramatic scene where massive plastic sheets billow as propelled by blasting industrial fans. While threadbare conceptually, the sheer scale of the gesture registers at a primordial level—viewers flocked to the work every time it fires up. Much more oblique in engineering and effect are standout installations from the hometown artist duo Project EVA and German artist Ralf Baecker. Project EVA’s Object of the Internet encapsulates online existence through an immersive chamber, in which viewers insert their head and are subjected to whirlwind kaleidoscopic reflections of their likeness—pure torture or vanity, depending on your perspective. 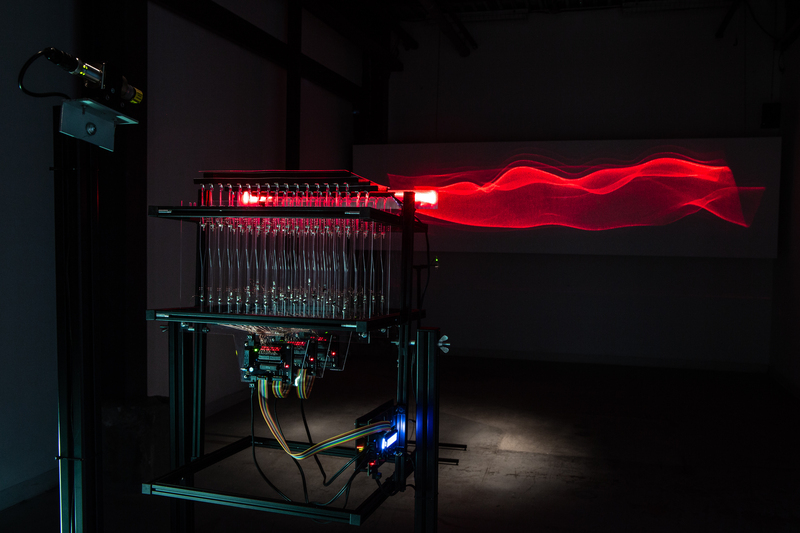 Beacker’s Mirage is exactly that, a vision, that uses an elaborate hardware software assembly to beam a shimmering, slowly evolving red laser landscape. ‘Mirage’ is an apt metaphor for not just this edition of BIAN, but the entire enterprise. 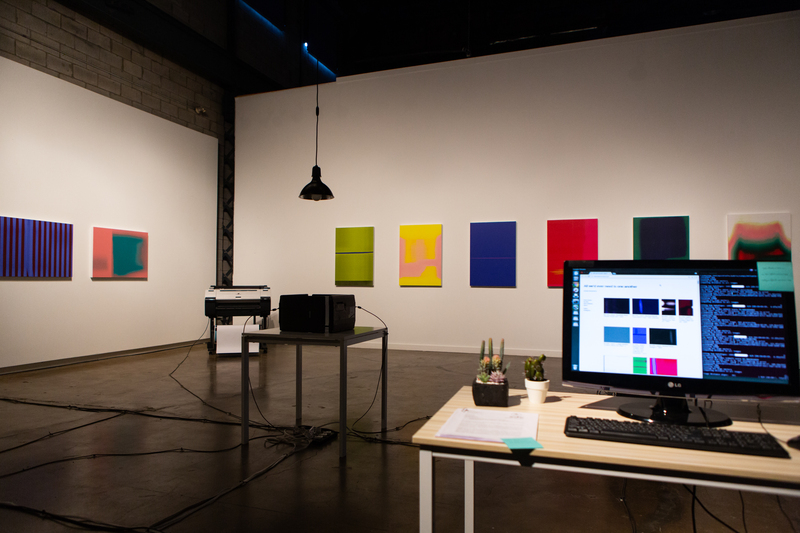 Yes, the shows feature dozens of artists and sprawls across tens of thousands of square feet—as a biennial should— but the service this kind of survey performs is all the more appreciated when the subject is digital art, which is all-to-often relegated to the margins. Once again BIAN has taken a compelling ‘core sample’ of the myriad dynamic practices operating at the unstable threshold between digital art communities and the broader contemporary art world. The 4th edition of BIAN runs through 5 August 2018 at Arsenal Contemporary Art.